This Aloe polyphylla has been planted out for several years now, has been snowed on, trodden on by the firemen in 2013 and has sailed through, getting bigger each year. We are hoping to see it flower - maybe next year! With winter now underway, it is all too easy to neglect your garden space. This is primarily thanks to a combination of adverse weather conditions and falling temperatures, which make it difficult to complete tasks such as cultivating seeds, turning over soil and even mowing the lawn. With this years’ winter set to be colder and more unpleasant than in recent years, there is a chance that your outdoor space may even become something of a no-go zone in the months ahead. Before you being to construct your gate, it is important that you measure out the space accurately. Make a note of these dimensions, and consider them in line with any future development plans that you may have for your space. You must also calculate these measurements according to general construction rules, typically by ensuring that your posts are no longer than five feet apart. This will help to secure your frame and structure once it is in place. With your measurements having being taken, the next step is to ensure that you have the requisite tools and components to complete the job. This is often easier said than done, as there can be a surprising amount of hardware required to create a functional and durable gate that is well engineered. One of the key considerations is your choice of suppliers, as you should to source your items from reputable trade retailer such as Barrier Components in a bid to guarantee quality while reducing costs. With your measurements in place, you should have a clear understanding of where to dig and install your posts. Then be sure to dig your holes to a depth of approximately 1-2 feet, before sinking your posts into the spaces and ensuring that they are secured in place. The depth of each hole is important, as shallow spaces will leave your gate unsecure and ultimately distinguish it as a hazard. One your posts are secure, you can fit your hinges and gateway to complete the task and provide an added security dimension to the security of your home. To novice or aspiring gardeners, the winter months hardly seem like the ideal time to cultivate crops or plant seeds. Experienced gardeners know better, however, as gardening is in fact more of a full-time hobby that can be practiced all year round. November is an excellent time to move any deciduous shrubs, for example, and by digging up the root and replanting them in a new position you can optimise their growth. This little known fact underlines the complexity of gardening and the challenges facing enthusiasts all year round. Novices may also have heard of building raised beds in their garden, as this is another relatively simple tasks that can help individuals to avoid a host of outdoor challenges. As a starting point, it is important to note that raised beds are filled with a customised soil and compost blend, rather than standard soil that can require replacing all too often. This reduces the labour associated with maintaining your garden space, as does the fact that drainage is built into the bed walls to negate the risk or erosion. In the summer months, raised beds also provide plants with greater exposure to the sun and helps to extend the traditional growing season. On the issue of labour, raising the soil level and planting an elevated bed by even a relatively small amount reduces the hard work required to place seeds, weed and harvest crops. Even sensible and proactive gardeners who use multipurpose tools from a reputable supplier such as Anglia Tools can struggle with the physical intensity of outdoor chores, and having a slightly raised bed can help to ease this burden. When it comes to building your raised bed, it is important to identify the necessary construction materials. As it is essentially a bottomless frame that is set into a shallow trench, you will need to focus on building up the sides with various materials including rock, brick concrete or even interlocking blocks. Timber is the most popular construction material for raised beds, however, although you will need to avoid using wood that is preserved with toxins if you intend to grow edibles. On a similar note, you should also avoid placing creosote treated railroad ties to reinforce your raised bed. This is also unsafe for crops or edibles, as toxins can escape into the soil and place your family and friends at risk. Polytunnels are useful for all kinds of gardening requirements you may have. In an extended growing season they can help you save significant amounts of money, making them valuable for you and your garden. However it’s important to bear in mind that even though polytunnels may be rather cheaper than greenhouses considering the equivalent growing area they cover, they still come with a price attached. There are ways that you can go ahead and build your very own polytunnel from scratch with very basic parts that you can source easily and at a low cost. Here is our guide to doing just that. The two main parts of any polytunnel are its tunnel framework and its polythene cover. There are various places you can go to look for a suitable long-lasting cover, and these are easy and affordable to find. The framework itself is the trickier part that you’ll have to get stuck into as your new DIY project. 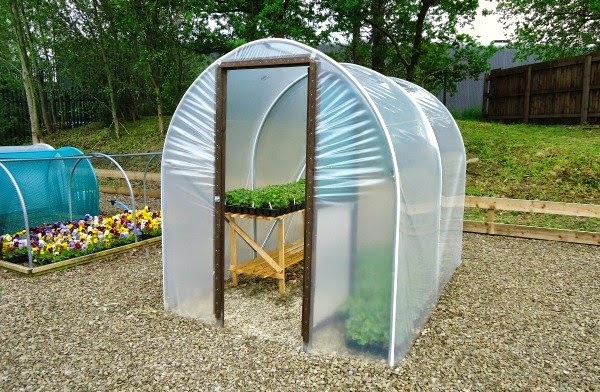 A normal polytunnel framework is made out of hoops of aluminium tubing. If you don’t use aluminium you can of course use a similar metal. You can replicate this using offcuts of scaffolding tubes and mains water pipes, both of which you may be able to find free of charge at a building site, or which you can purchase at a very low cost nearby. A typical scaffolding pole of 48mm outside diameter should be cut to a length of around six foot, and then driven into the ground to a depth of around three foot, sticking up out of the ground. This leaves three feet out of the ground to give you a polytunnel with three foot high straight sides. To prevent the tube from getting damaged you should use a heavy hammer with a block of wood on top. Using a spirit level will also help you to make sure that the poles are vertical. Then once that is done you can cut your mains water pipe of 50mm inside diameter long enough that when each end is pushed over a scaffolding pole it forms an apex at around eight feet above ground. You can then cut the remaining pipes to an identical length. It’s important to make sure the water pipe is safe and secure, and to do so you must drill a hole through the pipe and scaffolding tube and then secure it using a nut and bolt. Or you can simply put a large nail through the hole, cut off all but the last inch, then bend the rest around to the inside of the polytunnel. The polytunnel cover meanwhile won’t come into contact with any metal, so you don’t need to use polytunnel hot spot tape. To finish the job, position your hoops at intervals of four to five feet along the length of the polytunnel in order to hold the component parts of your polytunnel securely in place. Then you can leave it in position in your garden and enjoy the benefits it brings. Autumn is officially here and whether you dread the colder days or love the falling leaves, it’s time to flow with the season. Naturally, the significant change will mean that your garden needs some tender loving care. But this is when things slow down, unlike in crazy spring. So prepare your garden for winter and keep things weather-resistant with these quick tips on keeping your garden tidy this autumn. If you’re anywhere near a bunch of beautiful trees or even have a garden open to blustery winds, you’re bound to find lots of dead leaves lying in your garden. Some people don’t mind but beware that these are lovely homes for all kinds of mould, fungi, insects and pests like slugs. Plus it helps to remove the leaves quickly and easily to a safe compost pile or handy leaf mould when you want to mow your lawn for one of the last times before winter! Keep things tidy by using a traditional rake or even a fancy leaf blower. It’s time to pack away that summer garden furniture and clean off those garden tools into some dry, safe and neat storage. Garden sheds are great but they don’t always keep the cobwebs out. Check this website out for some modern looking and easy to maintain garden storage ideas. Deck boxes, cupboards, shelves and even garages are good places to store away all your garden accessories during the autumn and winter. Summer plants and flowers will begin to wilt and fall away during the autumn so it’s important to trim them and tend to their leaves to keep them safe for deflowering next year. Carefully clip off any dead flowers, leaves or stalks and keep them in a compost heap or garden bin so that they don’t fall all over your garden lawn and create an unwanted and unkempt mess! We all know that weeds need to be kept in check but thankfully, during the colder months, they don’t really tent to bother our gardens that much! However, it’s important to get rid of them once and for all in the autumn so that they don’t drop their seeds and sprout in spring next year. Get your weed killer to hand and say good bye to them for the foreseeable future to keep your garden looking great! For many people the shed is simply a place to house garden tools. Although a shed is indisputably useful for this task, do you not feel like you’re missing out on so much more? It really needn’t be damp, dark and musky because, with a little hint of planning and motivation, you can turn your shed into a fully-fledged workshop that allows you to do all of your DIY tasks. Here’s how to do just that. Of course, (a little obviously), the first stage if you don’t have a shed is to get one from somewhere such as ilikesheds.com. Metal is best here, as it leaves you room to expand if you really do catch the DIY bug! From here, all you need is a little elbow grease and you’re on your way to converting your shed into a bright and airy room suitable for any DIY task. One thing you should certainly consider for your shed is a heating system, and underfloor ones are available so that you can still keep all of your floor space. These only run at relatively low temperatures, but if you don’t want the additional expenditure, then consider a cheaper alternative such as insulation. In a wooden shed, around 70% of heat is lost through the roof or floor, so prioritise those areas first. As well as heat, you’ll also need light. Of course, if you’re buying new, then you can choose an option that maximises light, but if not then simply replace one of your old roof panels with an insulating plastic sheet. Simple, cheap and effective. If you’re going to be doing DIY in your shed then you’re going to have to install a power supply. Of course, unless you’ve had vast experience with this sort of thing, then it is always better to call in a qualified electrician who will have the job done quickly and, more importantly, safely. Don’t take the risk and put your new shed (and your life) in jeopardy before you have even begun. Sadly, although your new shed is a great asset, it will quickly become a target for thieves; particularly after they’ve heard the power tools. Due to this, you need to make sure you’re secured. For this reason, although a padlock is cheap, it’s best to have either a motion sensor or an alarm as well (preferably both), as these will deter thieves who will be aware the shed is monitored. It may seem like an expensive option, but it’ll help you sleep at night and protect hundreds if not thousands of pounds worth of power tools. This list is by no means extensive, but hopefully it gives you a good idea for how you can turn your shed into a workshop, or at least whetted your appetite. So, go on, what are you waiting for? Most people make the mistake of thinking that a garden is something to be enjoyed exclusively in the day time, but I genuinely love our garden at night time too. Yes, flowers look beautiful in the sunshine, but there are so many beautiful things to see when you spend your evenings in the garden. From summer barbecues to autumn bonfires, there are so many opportunities to spend time in the garden at night, which is why it is important to get your night garden up to scratch. Here are some ideas to help you get your garden looking great when the sun goes down. Have you ever noticed how white flowers look in the moonlight? If you haven’t, the best way I can describe them is to say that they glow in the dark! Okay, okay, so not really glow in the dark, but they do have a definite glow to them. If you plan on spending plenty of time in your garden at night, then white or pale flowers are the best way to brighten up your garden naturally. Did you know that there are actually certain types of flowers that only flower in the evening? I love the Evening Primrose in particular - it’s such a stunning flower that only starts to come out at dusk. Not only does it have plenty of pretty yellows blooms, but its scent is gorgeous too. Don’t forget Four O’Clocks which, as the name suggests, come out in the late afternoon when it begins to get cooler. These flowers are only viable at night and will have shrunk away by the morning. If you want something a little more exotic then the Dragon Fruit Flower will not disappoint. As you know, our garden is one of our favourite places to spend our time and so we’ve invested in some garden lighting to allow us to stay out a little later. Don’t worry, garden lighting doesn’t mean you have anything tacky or neon (no thank you!) and there is something to suit every taste. Companies such as Scotlight Direct have a fantastic range of stylish outdoor lights to choose from. We love wildlife, and from bats to hedgehogs to badgers, so many animals come out and play at night and it’s so easy to make your garden welcoming for them. If you can, put out cat or dog food and a plate of water (never milk!) for hedgehogs and peanuts for badgers and just sit back and watch them enjoying your garden too. If you have trees, then you can even put up bat boxes too, but be careful not to disturb or upset them as they are a protected species. I hope this inspires you to enjoy your garden at night as much as we enjoy ours. Do you have any great ideas for creating a fabulous night-time garden? As autumn approaches and signs of those long nights are slowly creeping in, your time in the garden becomes less and less, and so do the maintenance and garden jobs. So if you’re thinking about how to store your tools at the end of the season, then you’re in the right place. Having a tool shed or garden building to store your tools is essential, as your tools need to be dry to be in the best condition for next year. Before you store anything, sharpen or replace blades on tools that cut or dig. Filing can easily sharpen any tools that have worn down over time. Use a medium grit sharpening stone to hone and maintain the sharp edge of any cutting tool. For faster cutting, wet the stone with water or honing oil. Don’t attempt to sharpen a trimmer or any other tool with a serrated blade. Most digging tools aren’t sold sharpened, so you should sharpen them from the start. File the working edge to a 45 degree bevel with a course file. Rub the blade with a wire brush to remove any rust, and wipe down the metal with light oil to prevent corrosion. Check your tools’ handles for splinters or cracks. Smooth handles with a medium grit emery cloth (emery cloth doesn’t tear as easily as sandpaper). Wipe a dry handle with linseed oil to rejuvenate and protect the wood over the winter. If your handle is broken, then you should always replace it. If your mower is petrol, then make sure it’s out of fuel by running it until it runs out and the motor stops. Change the oil and remove the spark plugs and change them if necessary. Clean the engine and the frame of the mower, using a scraper to remove any built up grass and dirt on the underside of the motor. If you have an electric mower, unplug it before you start any cleaning. Check the condition of the blade and if it needs sharpening, use a heavy file to remove dull edges or you can simply replace it. Make sure that any shutoff valves or spray nozzles are detached from the hose and stored inside. Drain out your hose, roll it up and store inside. Cold hoses can be stiff and difficult to use, so if you can, store somewhere warm. There are lots of different ways that you can organise your shed, but as long as you can find everything you need and it’s in a good condition when you do, then you can organise it however you like. Fence at the Portland Japanese Garden, Oregon. Made in La Bella Italia!